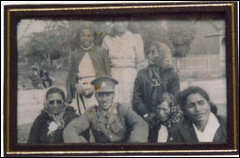 2nd Lieutenant Aubrey Te Ramaapakura Rota in Matatā, Te Awa o Te Atua with kuia (elderly ladies). Image from Charlie Wilson. Charlie is living in Te Puke. Permission to copyright is allowed. (Charlie the Greenstone and Whalebone Carver from Te Puke, Tūhourangi, Ngāti Rangitihi).